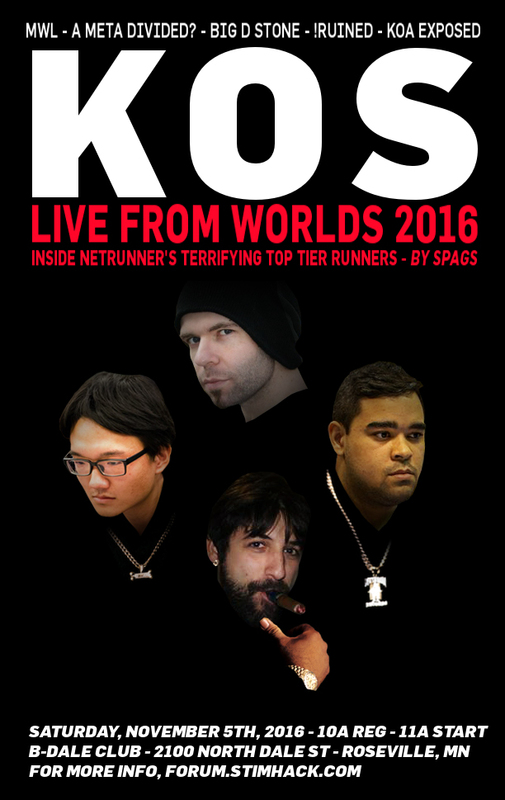 Welcome back for King of Servers 2016, the team tournament that was the highlight of Worlds 2015, brought to you by the ANRPC and Death Run Records. The last gathering was a smash, and everyone had a blast. However, half of one of the winning teams probably won’t even be at Worlds, so now is your chance to prove your strength! Our new venue for our hacktivist gathering will be at the B-Dale Club, in Roseville, MN. Registration will begin at 10A on Saturday, November 5th, and the cards will drop at 11A sharp (unless Jason Deng is late again). This is a team tournament. Teams of four can submit their team name and members here. There is a space cap of 38 teams. The team must represent all seven main Netrunner factions between their team, with the 8th faction being a Runner ID that is not going to be a duplicate on the team. The teammates will then play together, playing in a 6 round Swiss tournament. Teams will be paired according to Swiss rules, with teams of like total prestige facing off. Players in the matchups will then be seated in order of their individual prestige, so the highest prestige player on a team will play the highest prestige player on the opposing team, and so forth for the remaining three players. Table talk during the games will be fully allowed between teammates and their opponents. This is meant to be more fun and in the spirit of the event than downright piloting and direction. If one feels that there’s too much banter, and that their game is being too hampered and slowed by the table talk, they may call a judge to observe and/or give a warning. Rounds will be 70 minutes. When time is called, the current turn is finished, and the other player gets one full turn. There will be NO table talk, from teammates nor observers, during the last 5 minutes of the round, to allow for more concentration by those left alive. Entry fees are $25 per person, to cover a variety of costs, including the hall, bartender, prizes, streaming, etc. All will receive a variety of participation prizes. Third and fourth place will receive their entry fees back, and the top two teams will receive a 70-30 split of the remainder of the pool (unless they are true sportspeople, and decide to split it beforehand). There will be a break for food after the third round, roughly around 4P. We will have a dedicated bartender from 11:30A on. NO outside drink is allowed. Quality streaming and commentary will once again be provided by @dodgepong and @Sotomatic. If there are any questions, please post them in this thread. Thanks, and good luck! I’ll be streaming this event with the help of @sotomatic! The fourth runner should be a mini faction. You know… for humor reasons. For those who didn’t play in KoS last year, it was by far the highlight of Worlds weekend. You owe it to yourself to get a team together for this. Hooray! Psyched that this is happening again. I vote that it be a Mini-Faction or Professor. Because the same reasons. MN peoples, it is time to rep the state. Who wants to team up? What is the entry fee per team? Or will that change depending on amount of sign-ups? $20 per person. Going lighter on people’s budget, which means less prize money. I’ll let you dorks know if I’m going soon as I can. KOS was a blast. If you are going to worlds, go to KOS. Just trust me. I know you dont trust anything else I tell you, but trust this at least. Can we book a spot without a complete team? Part of our team is awaiting FFG’s “final wave” or tickets, so right now it’s me and some TBDs. El-ad Memorial Project is ready to win this year. And not split with the treacherous Brits. Another plug: the 2016 Worlds map portal is a resource for attendees coming from out of town. I’ve highlighted the lodging options and mostly non-chain eating establishments, and you can figure out how you’ll need to get around. The B-Dale is a couple miles east of the Event Center and south of Highway 36. Still hammering out if they’ll serve food, and beer options are open. No Tecate. I formally request Morning Wood (Coffee Stout), Size 7 or Hop Dish (IPAs), and Grain Belt Premium (Cheap Lager). Local beers, one and all. Are !Ruined cards legal for this event?